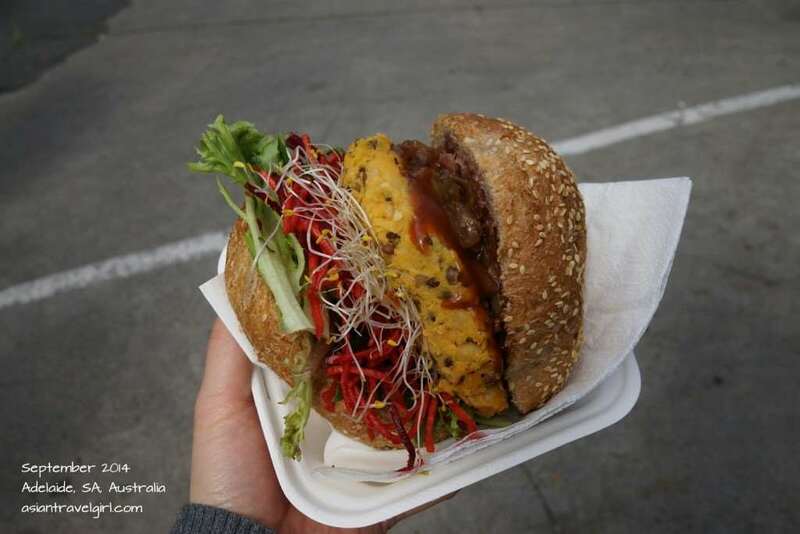 Popular veggie burger mobile truck that opens on Sunday at Market Shed on Holland Street. All the ingredients of the burgers were organic and sourced from local suppliers and the burgers was delicious and filling. 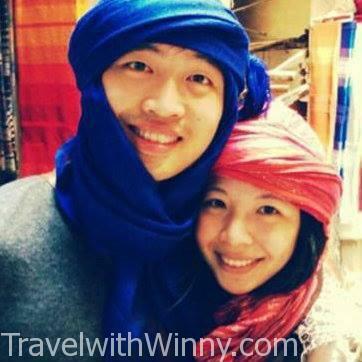 Have to find the location via Facebook. 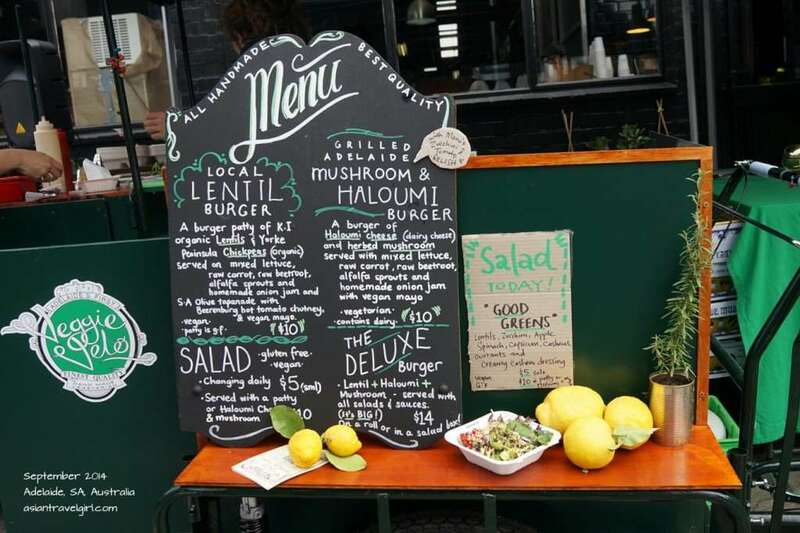 In search of the healthy food options in Adelaide, I came across Veggie Velo– a bicycle that makes the best veggie burger in town. When I found them online in August, they were on holidays, it wasn’t until last Sunday they opened again at the Market Shed on Holland Street. I was so excited when I saw the announcement on Facebook (Since they don’t have a fix location, you will have to check Facebook everyday to see where they are on that day), we got up early that day just to try out the veggie burgers. The menu changes everyday day depending on the availability. There’s always 2 burger options and a salad for ordering. All the ingredients were organic and sourced from local suppliers. Everything was home-made where possible. Even though there were only 2 options available, I would still have a hard time choosing which ones to have. Luckily York was there with me, we will order one each and I will eat off his- problem solved. 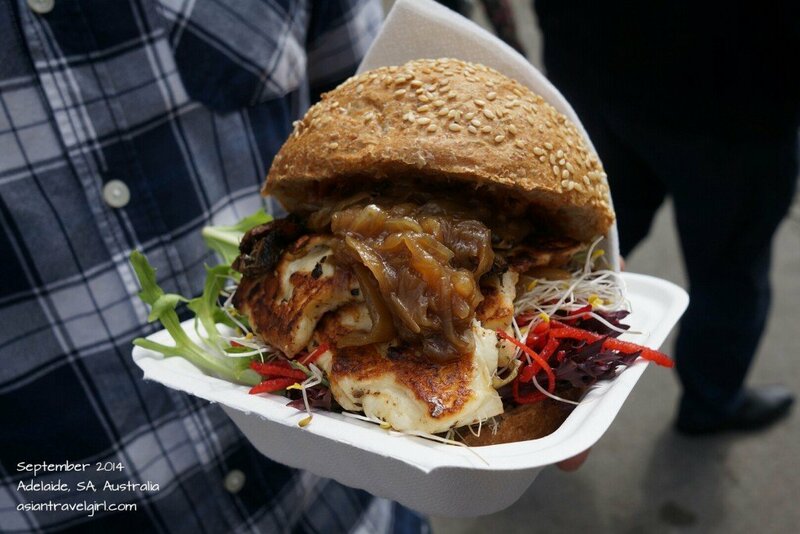 According to the reviews, there is always a huge line up for Veggie Velo, however we were pretty lucky that day. Ordered as soon as we got there and had the burger in our hands within minutes. Probably because it wasn’t lunch time yet. When we got the burger, I was surprised at the size! The bun could not contain the burger fillings at all! I couldn’t wait to eat it! I guess the downside buying from a stall is that you don’t have a place to sit, that was fine with us since we grew up in Taiwan, plenty of night markets there. 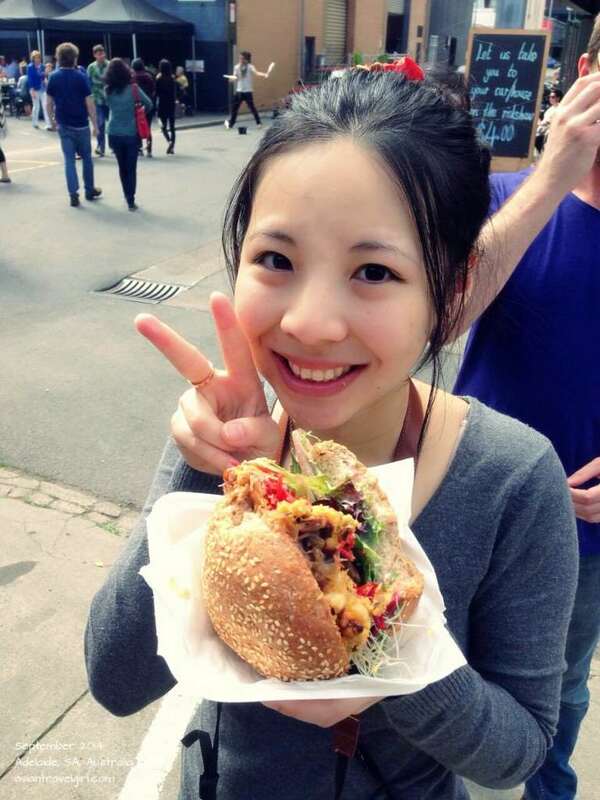 Look at the size of the burger compare to my face! The burgers we ordered were “Local Lentil Burger”- A burger patty of Kangaroo Island organic lentils & Yorke Peninsula chickpeas (organic) served on mixed lettuce, raw carrot, raw beetroot, alfalfa sprouts and homemade onion jam and SA Olive tapanade with Beerenburg hot tomato chutney & vegan mayo and “Grilled Adelaide Mushroom & Haloumi Burger”- A burger of Haloumi cheese (dairy cheese) and herb mushroom served with mixed lettuce, raw carrot, raw beetroot, alfalfa sprouts and homemade onioin jam with vegan mayo. Both of them were AUD$10 each. Grilled Adelaide Mushroom & Haloumi Burger- A burger of Haloumi cheese (dairy cheese) and herb mushroom served with mixed lettuce, raw carrot, raw beetroot, alfalfa sprouts and homemade onioin jam with vegan mayo. The amount of haloumi given were generous! There were so many pieces I don’t even know how come the burger only costed AUD$10! There were a lot of flavors in this burger, York and I really enjoyed this one. It’s hard to imagine something this tasty is pure vegetarian. The lentil burger tasted a bit bland according to York. I agree the flavor in this burger wasn’t as strong as the Haloumi burger, but I loved it anyway. The pattie was made of organic lentils and chickpeas which was extremely filling. Mixed with my favorite raw beetroot and homemade onion jam, I can probably have this every single day. 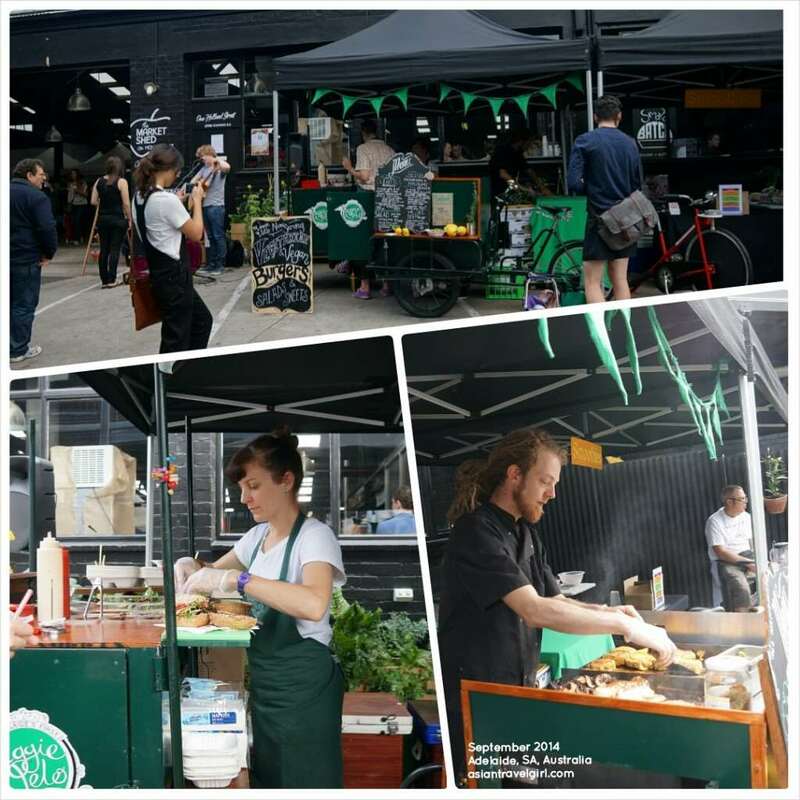 Because of Veggie Velo I discovered the existence of the Market Shed on Holland Street (read more for my discovery of other organic stalls within the market). Overall I love this place and I would definitely come back again! Highly recommend it to all the veggie lovers and vegetarians!